Engr. Muhammad Ishtiaq, graduate in Metallurgy & Materials Engineering from Department of Metallurgy and Materials Engineering, College of Engineering & Emerging Technologies, University of the Punjab in 2010. In 2013, he started his career as Lab Engineer at Department of Metallurgy and Materials Engineering, College of Engineering & Emerging Technologies, University of the Punjab, Lahore. In 2015, he completed M.Sc. (Engg.) in Metallurgical and Materials Engineering from University of Engineering and Technology, Lahore. 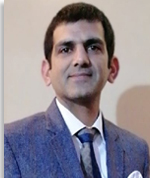 In the same year, he enrolled as PhD student at the department of Metallurgy and Materials Engineering, College of Engineering & Emerging Technologies, University of the Punjab, Lahore. Later he was appointed as Lecturer on contract basis in Dec, 2016. He is working as a lecturer from Dec, 2016 to date imparting lectures in various subjects. He is also engaged in research activities & materials testing activities in the department.